Our original plan for Friday was for a bit of a beach day – let the artists out to paint and play by the water. However… the weather once again didn’t cooperate, and the day dawned clear, cool and windy, a classic bura pattern. Over a breakfast of coffee and the remainder of the birthday cake at Lem’s, we took a vote on how to spend the day. Everyone liked the idea of a walk along the coast road into nearby Jelsa, so that’s what we did. The view to the mainland shows a string of white, puffy clouds in front of the coastal mountains. It’s an interesting effect and I guess marks some kind of delineation between layers. Our route takes us along a quiet stretch of coast, with the sea on our left, mostly through pine forest to start with. Gradually, though we enter what you might call apartmentland, where locals have built their idyllic hideaways near the shore to rent out to tourists. 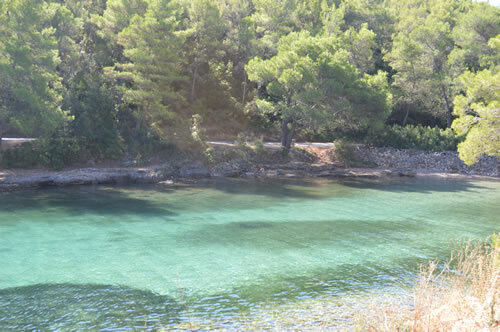 The water in the little bays is a lovely clear azure – a gorgeous colour against the green of the pines! Now I remembered the walk as taking about 40 minutes, but that turned out to be a touch optimistic. It’s actually further than I thought – about 5km (or 3 miles) and more like an hour by the time you stop for photos all the way. As we get further along towards Jelsa, there are hotels. 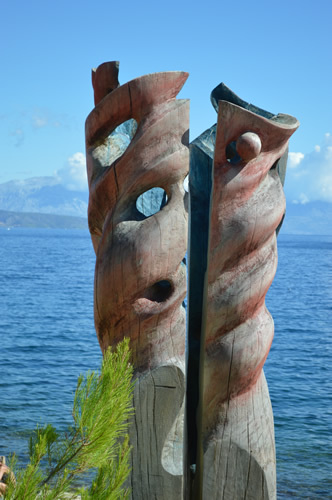 There’s also another of those large wood sculptures that appear in appear in various places next to roads, and on on the coast. I really enjoy these random works of art – my favourite being the two large carrots on Rabbit island! Not quite sure what these ones portray. Also on the way into Jelsa, there’s a small white building, which someone has thoughtfully roofed with old faded terracotta tiles. 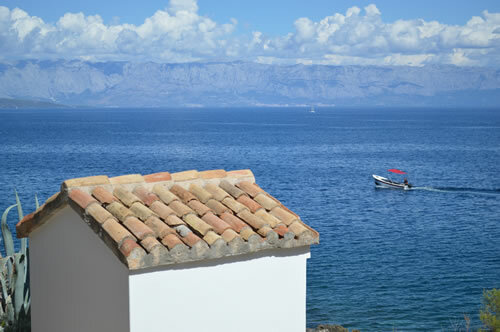 It makes for a beautiful picture against the blue of the sea – oooh and a boat with a red canopy! In Jelsa, we make our way to the main square and the Cafe Splendid, to meet up with the usual crowd of interesting folks. A couple of the artists are keen to walk even further, and they go off to explore. For the rest of us, it’s a coffee and lunchtime sandwich as we catch up on the local news and debate the Class 1 homework assignment. 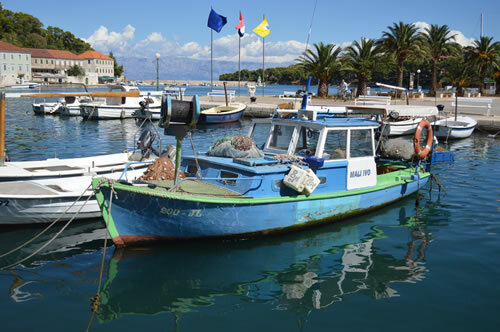 That last one is a new item on the Total Hvar daily routine, and very entertaining it is, too! After lunch we wander back to Vrboska each in our own time. Some have been sketching, and I notice that the boat “Mali Ivo” appears in a painting later! 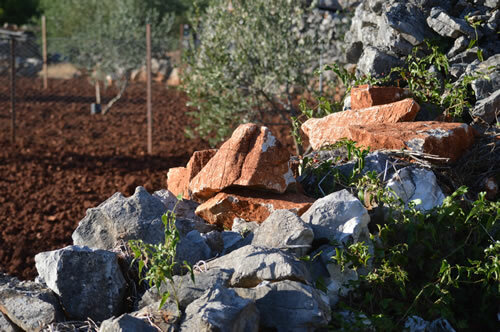 In the late afternoon, we’re off to one of the fields of the Stari Grad Plain. 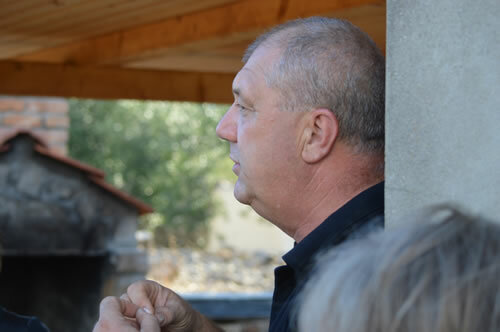 It belongs to Lui and Dragana, who are very proud of the island’s long history, and the traditions of growing vines, figs and olives here. We set out around 4:30, with a view to having some time to sketch and paint before the grill is fired up. It’s a fairly short walk to get there, thank goodness, as my legs were definitely feeling it after the 6 miles there and back into Jelsa! 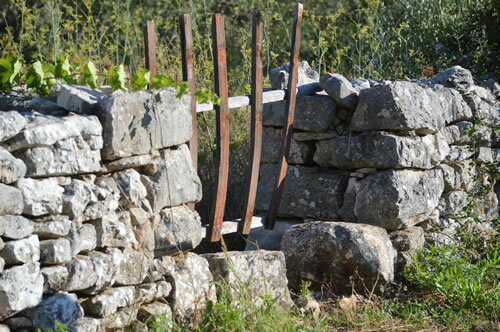 At the field, Lui explained about the importance of clearing the rocks from the fields, and how the walls here date back to the ancient Greeks. It’s a wonderful continuity, to think that these fields have been farmed for so long. Lui shows us around his vineyard. 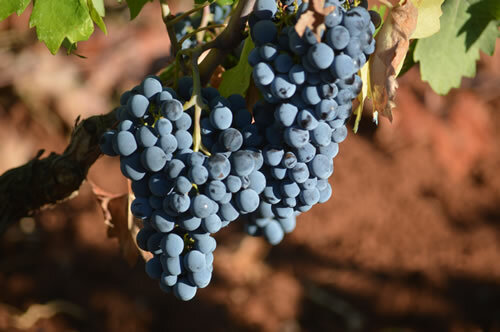 The white grapes are bogdanuša, and the black (blue, really!) are plavac mali. We can paint them now, and drink them later! 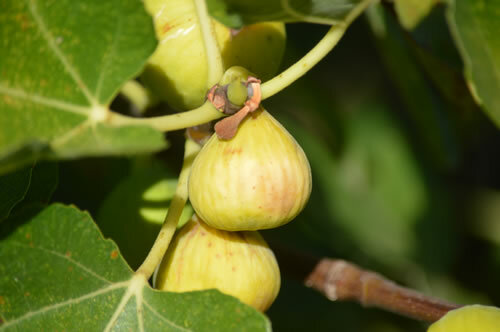 The fig trees in the top corner are laden with fruit, and we’re invited to help ourselves. There’s really nothing quite like sweet ripe figs, still warm from the sun. The softer the better! 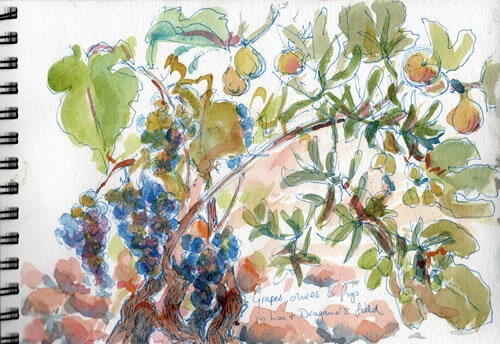 The olive trees don’t have so much fruit this year, as last year was a bumper crop. But I manage to find some to add to my sketch, before we’re called back to get a drink ready for dinner. By now, there’s a delicious aroma emanating from the grill area! The wine is, naturally, home-made from their own grapes, and is pretty good! As the sun sinks in the west, the clouds are lit with wonderful colours. 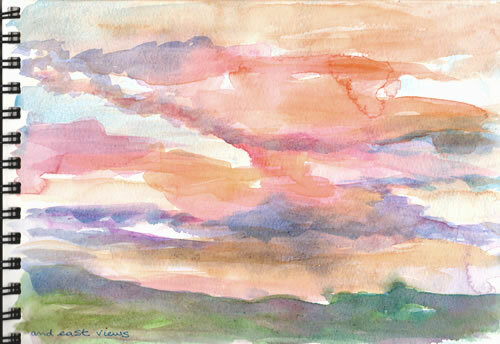 Another challenge – paint the sunset before it all fades to grey! You have to be really quick about it, and I’m not sure I did justice to the soft glowing clouds at all! 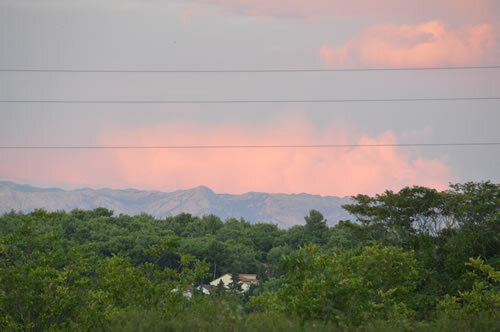 Much easier with the camera – but then I end up with power lines across the picture! As the light was dropping fast, we didn’t do our usual review of paintings tonight, but instead set the table for dinner. Fantastic evening, the food was absolutely delicious – mostly home-grown, aside from the meat and fish. Our hosts did us proud, and it was really special to spend the evening in their company. My version of the sunset painted live!